This past week I had the privilege and honor to be one of the small session trainers for the annual National Youth Conference which is organized by World Vision. 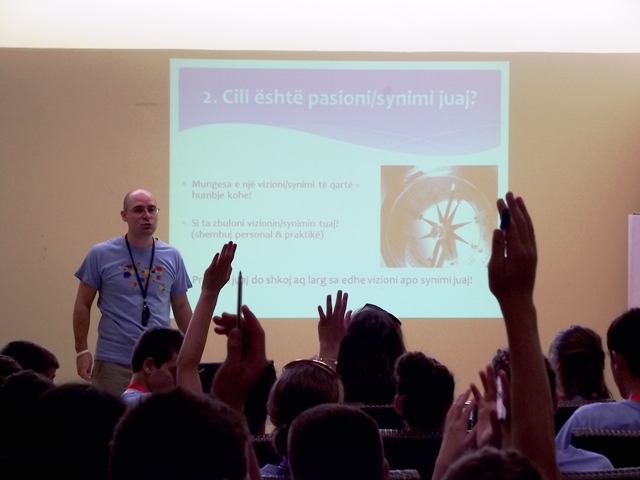 There were about 250 youths from all over Albania and Kosovo full of energy and curiosity. For me, the real challenge was not the topic (how to utilize social media communication for change) but rather the audience as I had not addressed youth groups for a couple of years. However, the entire experience turned out to be exhilarating and truly rewarding for me and I believe for those who participated as well. At first, my concern was the fact that I was not aware of their level of knowledge about the various social media platforms and tools such as blogs, Facebook, Twitter or even YouTube. However, to my complete delight and welcomed surprise, I found out that many of them were very aware and sufficiently knowledgeable about many of such platforms. Most had sufficient presentation and communication skills, which are all so very necessary in this time and age and especially as they relate to using social media for change. My other concern, regarded my ability to clearly communicate to them ideas and practical suggestions in a language and format that was as familiar to them as possible (potentially using jargon that they themselves used). But this again was overcome through good interactive teaching and communication. Ultimately, I was able to present the same training material in three different sessions under the title: Giving wings to your passion (through social media). The presentation(s) was well received and the youths’ interest was such that they would stay to ask all sorts of questions which mostly revolved around Facebook and its safe use as well as practical ways to utilize blogs. When I was told that I had 1.5 hours for these talks, I thought I had plenty of time, but all my presentation(s) went overtime. As their interest and questions would come in I found myself surrounded by youth who linger over the allotted time just to get answers to their questions. For me the other obvious fact was the reality that today’s Albanian youth are relatively well exposed to the various social media platforms but still not fully aware of their potential and more so the various dangers. The training topic and time were rather limiting and focused, however, I could not help but notice how much they needed to be explained things from a personal security viewpoint. Many of them, as most youth do, were quite unaware of the dangers of exposing personal information and data through the various social media platforms as well as the dangers coming from people trying to harm them by utilizing such platforms to gather information or just to influence them. Previous articleLet’s go for creative parking in Tirana!